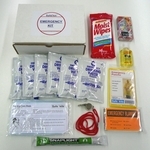 We have developed a range of emergency preparedness kits for students, teachers and office / classroom use. Our personal preparedness kits are lightweight so each child or employee can carry their own kit. 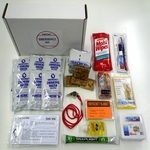 The disaster kits can be stored in central locations or in each classroom and are handed out to each individual in the event of an emergency or during evacuation training exercises. Short on funding to buy Emergency Supplies? Most schools use a program where parents are asked to pay for the emergency kits for their children. 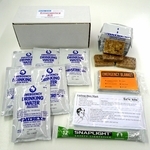 The school then stores these survival kits to have them available when needed. See how this Student Preparedness Program works by clicking here. And we are helping you by keeping the costs low for all of our Student Survival Kits to allow for a successful Emergency Preparedness Program at your school. How to get uniform emergency supplies for your students. 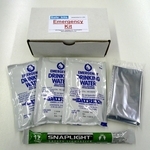 Do you need a custom made Emergency Kit? Get a quote from us for your needs.